So here is how the shelter looks today. 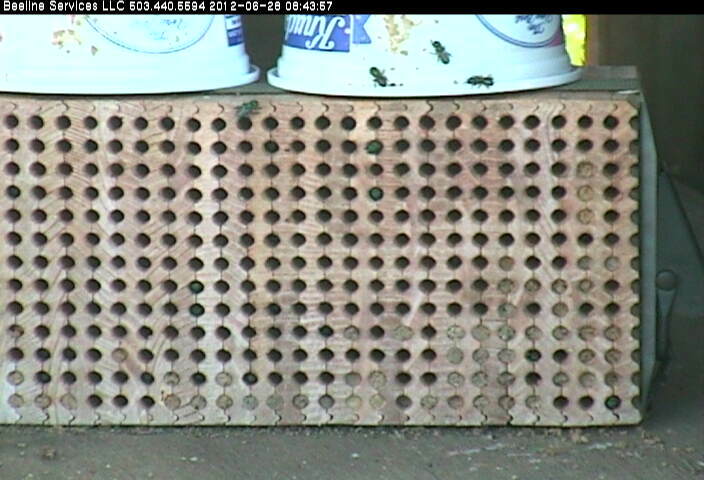 Temperatures have been up to 80oF, and the bees have been active. 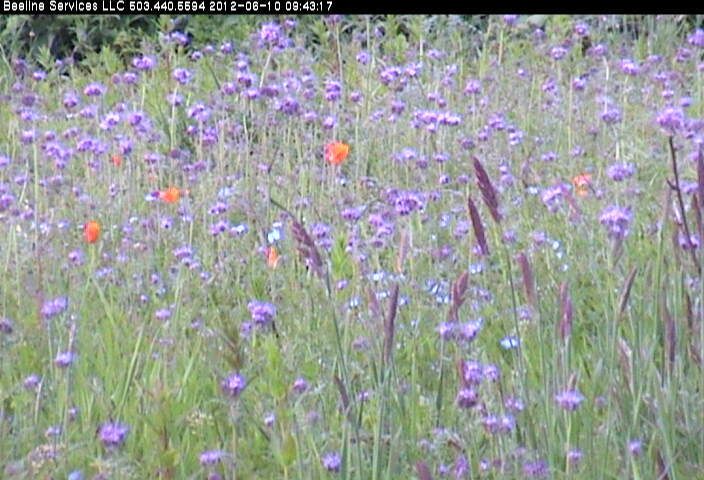 You can see the Phacelia and California poppy growing tall around the shelter. The second photo shows the O. lignaria Binderboard. The bottom two boards are almost completely plugged. There are 8 plugged nests in the top board, and signs that a couple of tunnels in the third row from the bottom still have females actively working on them. Looking closer at the O. aglaia Binderboard on the right in the third photo, the bottom board is filling along the left edge and the bottom. 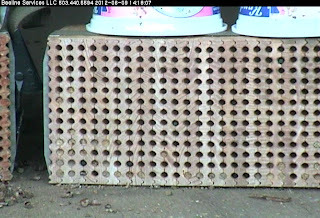 Fewer complete nests are visible on the top board. Some of the filled nests, maybe most of them, are O. lignaria mud plugs, but I think some are O. aglaia. 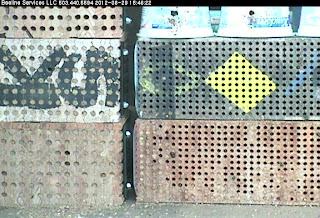 The fourth photo shows the Binderboard on the right side of the shelter, also plugged mostly along the bottom and the edges, also mostly with O. lignaria mud plugs. There are two active females sitting outside of the tunnel entrances. Their color looks like the blue-black of O. lignaria, but it's hard to tell for sure. I doubt that many O. lignaria are still active. 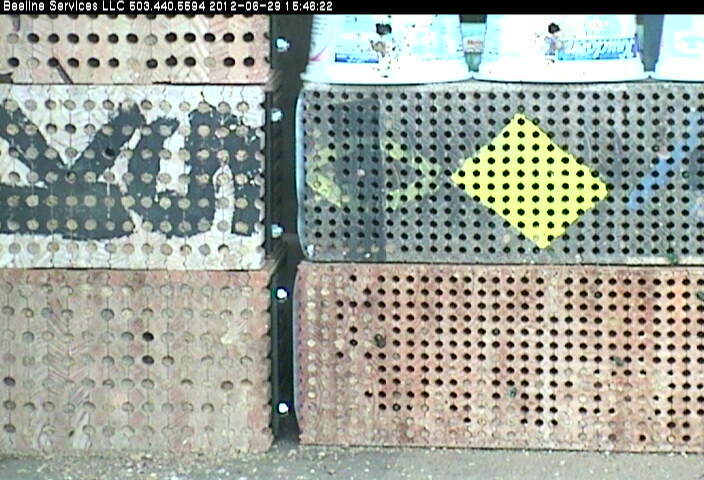 The final photo is a close up of the Binderboard on the right, taken yesterday morning, June 28 at 8:43 in the morning. Notice three O. aglaia sunning on the emergence container on top of the board, as well as a couple of females sunning on the Binderboard, and several bee faces at the tunnel entrances. It was about 64oF at the time, and I think that many of the bees were just starting their day. The camera has been a nice feature. Ultimately, if it could also zoom in on crop flowers, and most importantly to me—the ground areas around bee shelters so that we could monitor our wildflower seedling development—that would result in a lot more camera use on my part. It did save me a bit of travel time out to the site. And if I had site monitoring like this on many of my projects around the country, it could be a great tool. The resolution to date however has not been quite good enough for me to monitor seedling development as accurately I'd ultimately like. That said, I think this was a great first start at using this technology. Live web cams are tricky enough indoors, but to make it work on a remote site, with little connectivity, and lots of wind/rain I think is a pretty great accomplishment! Thanks for involving Xerces in this process! Thank you for your email. I would like to say that I found your webcam trial very useful indeed and am delighted you carried out the work. My view is that commercial pollinators as well as researchers will find this technology very advantageous, and ... I can think of several applications that could use the technology as it stands, and more than could be done by developing it. In terms of feedback on the current set-up, I think the main points have already been touched upon. The camera could be faster to respond, and the definition could be better. However, these issues can be remedied, I am sure. The key thing is that (a) you have done it and (b) it works. I never did a job yet that I didn't think I could do better the second time round. Thank you so much for carrying it through. I'm not sure what the pink spikes might be, I haven't been out to the farm for a couple of weeks to see what's starting to bloom. The plantings seem to be mostly successful (there are some larger ones that we've been working with Don to create). We have some annual weed problems, but I think they will decline over time as the slower to establish Oregon natives: Eriophyllum, Prunella, Gaillardia, Lupine, etc take off. Some of them won't even bloom the first year, but should they should fill in over time. On average we've got 5 to 10 wildflower seedlings per square foot. You might also be interested to know that I'm still seeing the odd O. lignaria in Portland here as well. Definitely not many, but whenever I've worked the garden lately, a few show up to collect fresh mud. Interesting the O. cornifrons in the neighborhood seem to have finished up earlier this year than the lignaria. I've never seen that before. In any case, we're starting to get some hot days now, and I imagine the spring bees will be finished up soon. My Feedback to Beeline Services: how has the webcam been helpful? Basically, despite the drawbacks with the system, I find it very useful. 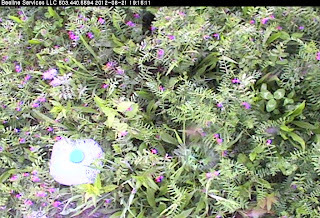 When I’m at home and working on the computer, which is most days except Saturdays, I bring up the webcam when I first log on, check the weather and the bee activity in Corbett, and sometimes check the flowers. I record in an excel file the time, temperature, and whether or not the bees are active. I try to do this several times a day. This is giving me a pretty good idea of how much foraging time the bees have had this season, which should correlate with their productivity, both in terms of flowers pollinated and bee cells produced. 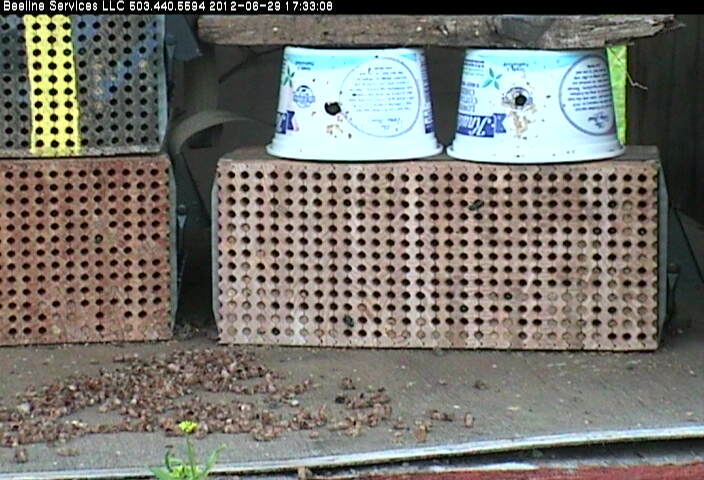 It’s easy to see whether or not it’s sunny by the shadows on the bee shelter in the default view of the bee nests. If it’s not sunny, I usually go to the “blueberries” preset to see if it’s wet or dry. On rainy days I can not only see the mud puddles, I also can usually see drops of water hanging off of the box that houses the camera. With access to this information, I felt this spring that I didn’t need to take the time and money to drive out to Corbett to see the bees. 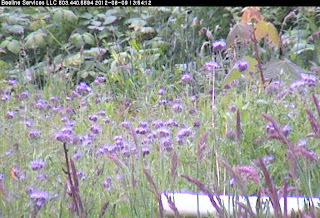 There are plenty of things that I could have done or seen by being there instead of watching on the webcam, but they were less important now that I can see what’s going on in the field most days. I’ve been a bit surprised at how long the season is in Corbett. With cooler spring temperatures and more rain, the orchard bees started activity later than bees here, and have been active much longer. 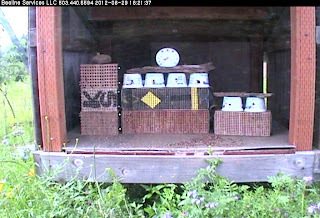 There were still some active orchard bees in the shelter on June 21, whereas here in Parma they had been finished for about three weeks. I would not have known this any other way, short of moving to Corbett. But if I did that, I wouldn’t have the comparative information about Parma, so that’s one big advantage of a webcam. 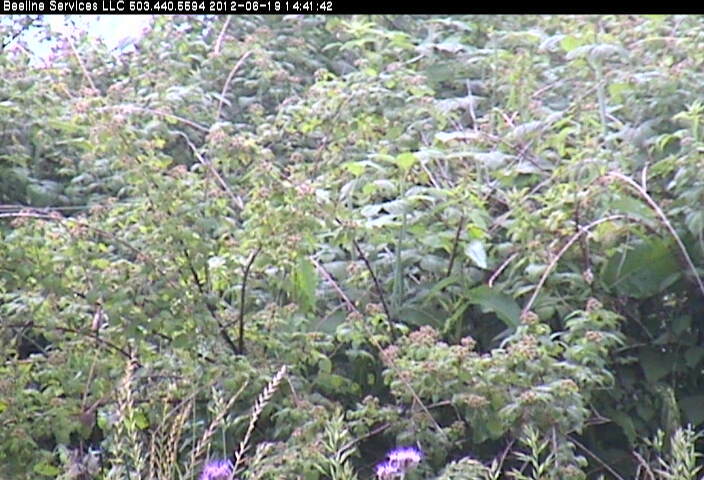 The webcam has also given me a much better sense of when the O. aglaia become active relative to O. lignaria, and relative to blueberry and black raspberry bloom. The O. aglaia became active too late relative for blueberry bloom this year, and they were probably not very helpful for black raspberry bloom except for two or three sunny days. The O. lignaria become active when the temperature reaches about 60oF. In contrast, the O. aglaia did not emerge until temperatures were up to the 70s and I don’t see them leave the nests to forage in the morning until it’s over 65oF and generally only on sunny days. This also is the kind of information that I could not get any other way except to camp out at the shelter. What’s great about the webcam is that I can get this information while doing other things. I don’t have to spend hours sitting in front of the shelter waiting for something to happen! 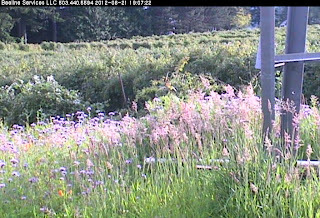 I like the ability to save images – that has worked very well, allowing for me to get images for my blog (a journal of what’s happening with the bees) and to keep track of changes in bloom status of the black raspberries, blueberries, and even the flowers that are planted in the road between the fields. I was not even aware that those flowers had been planted, but I was excited to see them start to bloom just as black raspberry was finishing. 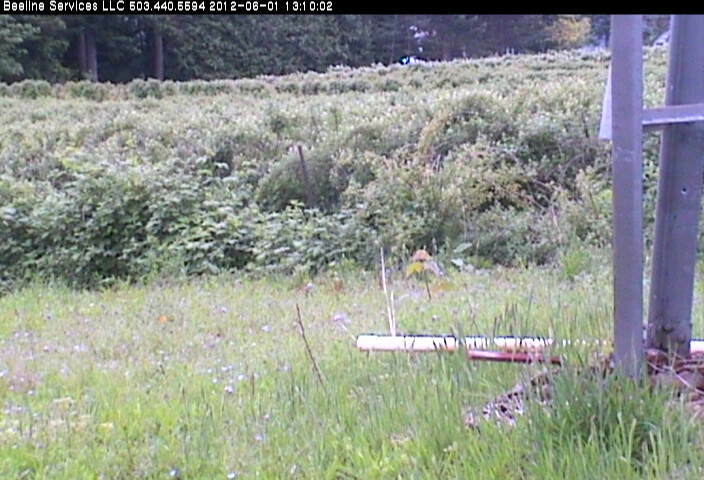 The photos have also been useful for assessing how fast the Binderboard nests have been filling, which species are nesting, and when the nest blocks are full. I was able to contact Rosie and let her know that new Binderboards were needed in the shelter for the O. lignaria. When I stop seeing active bees, I’ll able to contact her to take the nests out of the shelter, which should result in fewer unwanted species in the nests at the end of the season. I like being able to add pre-set views. 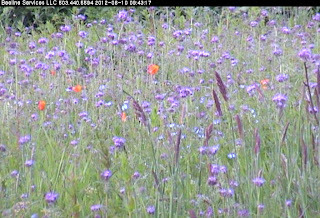 Over the season as different flowers came into bloom, and as nests filled and the thermometer moved around, it’s been very useful to add and change the presets. Except for a few early tries that didn’t work, it’s been relatively easy to do. 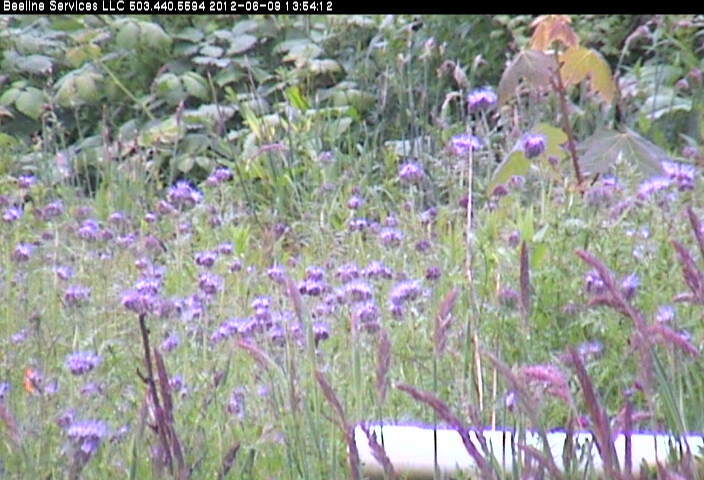 One drawback to the system is that I can’t really see much bee activity on the flowers. When blueberry was in bloom, I was able to make out bumblebee visits on two occasions – that was the only bee visitation that the blueberries had during the times when I tried to watch for flower visits. I think that O. lignaria would also have been visible on the blueberry flowers if they had visited while I was looking. On a number of occasions I tried to make 5 minute timings of bee visitors to blueberry, to get a sense of how often the flowers were visited. 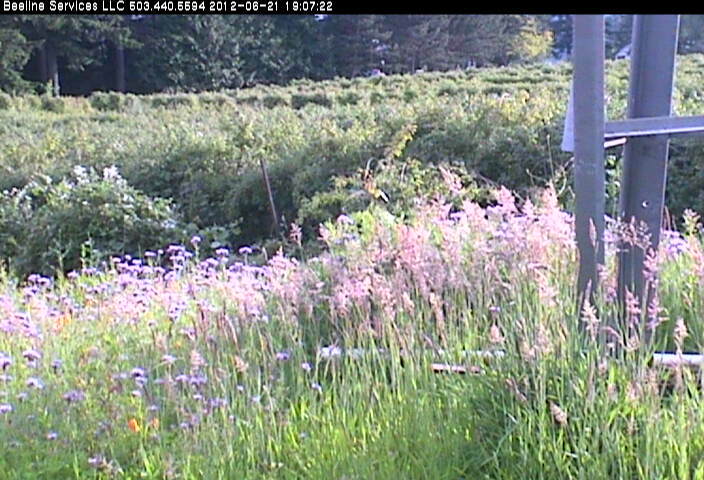 Visits were rare when I watched, and the same was true when we tried to watch bees on blueberry on the farm last year. So that information was useful and consistent, if disappointing. The black raspberries were much more difficult to watch for visitors than the blueberry, mostly because they are farther from the camera. 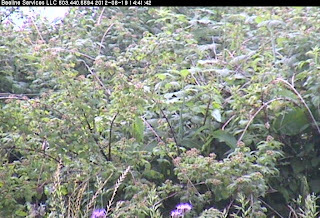 That could be remedied by moving the shelter and the camera closer to the raspberries. I doubt that Don would be willing to do that at this point because so much would have to be moved, but if we could set up the shelter again, I would ask to have it closer to the raspberries. I was able to detect visitors to the black raspberry flowers on a couple of occasions (dots that appeared and disappeared on the flowers) but couldn’t tell what they were. Still, by comparing images from overcast days, I have had a good sense of when the flowers started blooming, when they were in peak bloom, when they were past peak bloom, and when bloom was basically over. That’s been very helpful. I’m impressed that the bees are still active now that the raspberries are finished, and I think that’s because of the plantings in the road. Again, these are things that I wouldn’t have known any other way. As for the slow response of the camera, that is the main drawback with the system, and I can live with it because there is so much information that I can get anyway. If there were lots of guests using the camera, I might have difficulty making the observations that I need to make, but so far that’s not a problem. 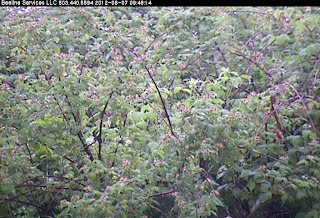 The images are not so exciting that lots of people would want to visit the webcam. Also, although the camera is less responsive on overcast days, that’s not a big problem for me because the bees are less active. So far there has always been enough power for me to check the temperature, weather conditions and bee activity even on overcast days. One minor problem that I’ve noticed is that the camera sometimes moves suddenly to focus on the ground below its shelter, at the base of a post. It seems to happen if I inadvertently click on the web image, or perhaps sometimes if I’m only running the mouse over the image. I haven’t quite figured out what causes it to do this, or what determines where it focuses when it makes these unwanted moves. But I can always go back to a preset after it happens. 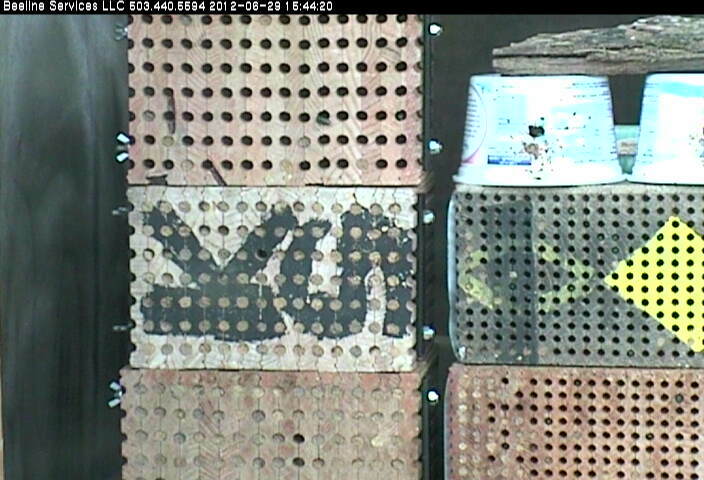 I’m impressed that the webcam has not needed much maintenance once you had Don fix the problem of condensation. (KNOCK WOOD!) So far the webcam has been there most of the time when I’ve tried to get to it. Although it sometimes disconnects when I’m not actively watching, I’ve always been able to reconnect when I’m actively watching again. So, overall the webcam has more than met my expectation. I hope that the Sturms will agree to continue using it in the future. On June 19, Mike Carter from Beeline Services e-mailed a request for feedback on the webcam. If you haven't had a chance to visit the webcam, contact me and I'll e-mail you the connection information. The webcam can be viewed between 7:30 am and 7:30pm, Pacific Daylight Savings Time. If you have comments on the webcam for Mike, submit a comment to this blog, or e-mail one of us. I'll post my response to Mike next. I'd like to get your candid views on how this tool has performed in its assigned role, and have you provide some insights and feedback on 'hits and misses' with the system now that its been in operation for a few months. While I don't expect the Sturms will be interested in spending any additional funds on the system, I'd like to wrap up my engineering documentation on the system with input from the end-user's point of view. Please also share this request with your associates, as candid input from them may provide a few additional insights we may not have considered in the requirements gathering / design phase. From my own perspective, the system isn't as responsive as I'd like it to be. Unfortunately, the factors involved are fairly complex and not easily addressed without significant changes to cellular carrier infrastructure. Data performance can vary greatly based on weather, carrier loading (traffic) and RF path variances to the cell site. Ultimately, the local ISP would have been the best route, but as they appear to be incapable of correctly configuring their own equipment, that option is not available. Yesturday, Monday June 18, it rained in Corbett, and the temperature didn't get above about 55oF in the bee shelter at the Sturm Berry Farm. 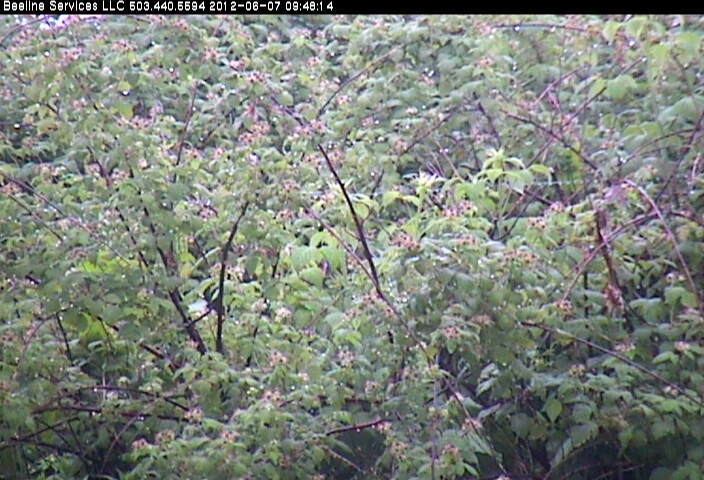 Rosie e-mailed me to confirm that the Black Raspberries are almost finished blooming; there are only a few blossoms left. She says "the pollination was good and the fruit looks good." Let's hope for some warm sunny days to ripen the fruit. Here's a photo of the the same branches of the black raspberry that I photographed on June 7, when it looked like bloom was past peak. 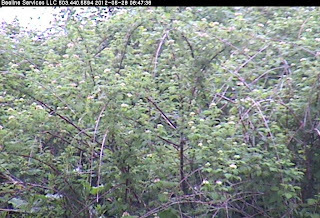 Today the inflorescences appear more brown than white or green, so I think that the webcam picks up enough of a color difference to get a sense of where we are in bloom. 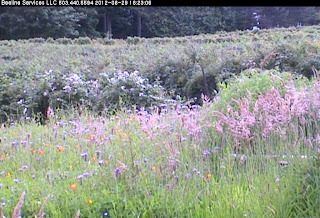 The bright pink flowers at the bottom of the photo are Phacelia. I'm still seeing a few active blue orchard bees, O. lignaria. There is one in the top right hand corner of the top orchard bee Binderboard. Faces of a few other bees are visible in nest entrances. 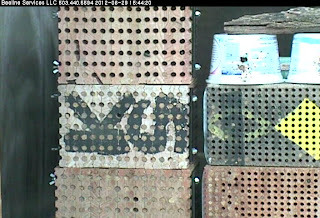 The bottom two Binderboard that were in the shelter at the beginning of the season are almost full at this time, and several new nests are plugged in the top Binderboard as well. Plus there are quite a few new O. lignaria nests in the smaller Binderboard intended for O. aglaia. The O. aglaia have been active on warm days, but not cool ones. They may be helping the pollination of other raspberry varieties, but my guess is that they didn't contribute much to the black raspberries. California poppies are now blooming among the Phacelia. I didn't notice them yesterday. This is a lovely combination. This morning at 9:45am it's sunny on the Sturm Berry Farm in Corbett, and about 58oF. The Osmia lignaria are active. I haven't seen O. aglaia yet, but they should become active soon. 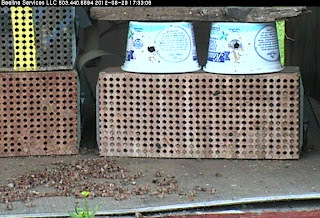 It's 67oF in the bee shelter, overcast, wet, probably drizzling today. The bees are mostly sitting in their tunnels waiting for warmer weather. From the "Raspberries wide view" preset, I can zoom in on these purple flowers in bloom in the road next to the black raspberry vines. Looks like Phacelia tanacetifolia to me. Don probably planted it as part of a project with the Xerces Society and the NRCS to create plantings to attract bees to the farm. Phacelia is one of the most attract bee plants around. I have quite a bit in my yard, and it is always humming with bees - honey bees, bumble bees, sweat bees, miner bees and more. With black raspberries finishing their bloom, this plant will help the bees increase their reproduction for the year. I hope they don't detract from pollination of other raspberry varieties. I'm not sure what are the thin, grass-like inflorescences. 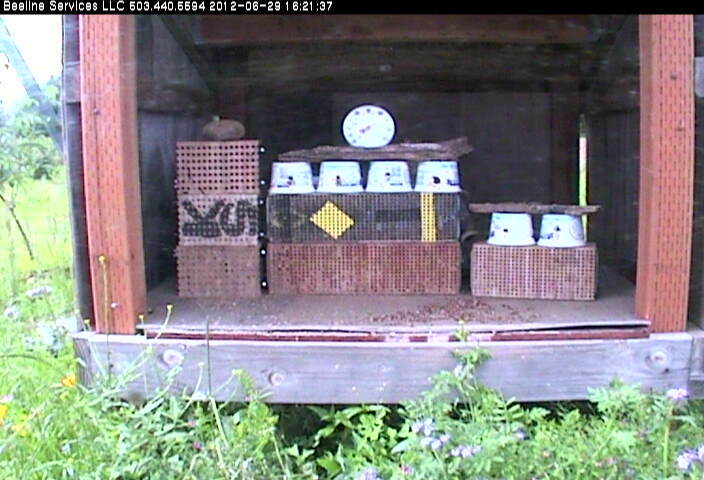 It's raining this morning in Corbett, 50oF, and so far there is no bee activity in the shelter. 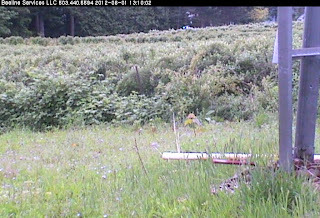 But the past week or so has been mostly sunny days with lots of bee activity in the shelter, except for rain on June 4 and in the morning of June 5. I've not spent much time trying to watch bee activity on the flowers because they are too far away to see the bees, but I'm sure the bees have been very busy. I was surprised to see today that many of the inflorescences appear to have green dots in the center - a sign that pollination is complete and fruits are starting to form. 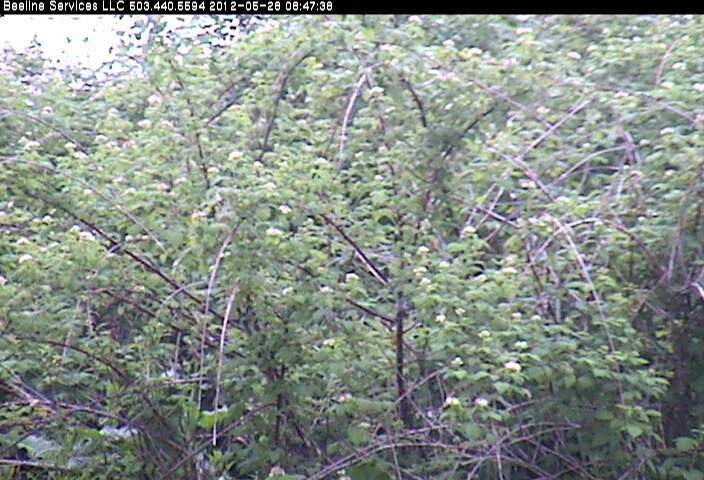 Compare today's webcam image of the black raspberry bushes with the second image from May 28 when the infloresences were all white flowers. Hopefully that means that there will be a large crop of berries. 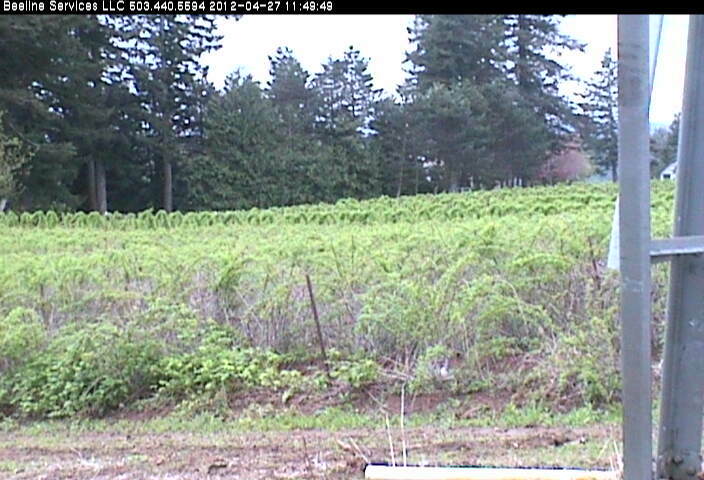 The third image is of the black raspberry field on June 1 when the berries were in full bloom, to compare with the same image in April, before bloom started (bottom image). On June 1 the raspberry bushes were covered in white inflorescences.